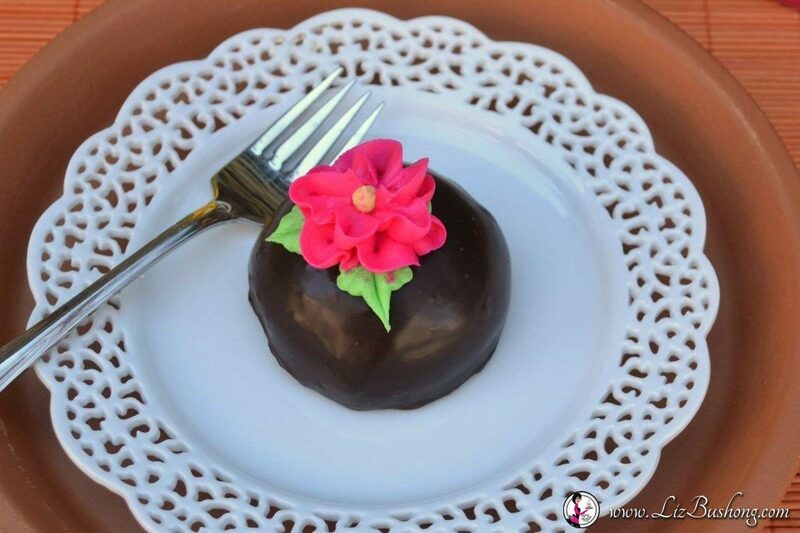 Make Dessert special with these delicious Chocolate Mousse Brownie cakes are made with a half round silicone baking mold, filled with creamy chocolate mousse, a brownie and covered with chocolate ganache. 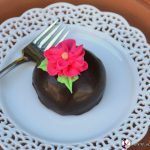 You can dress it up with piped buttercream flowers or if using an oval silicone mold decorate the mini dessert like an Easter Egg. First make the boxed Brownies as per recipe but bake in 9 x 13″ baking sheet, cool and freeze 20 minutes. Brownie batter should be 1/2 ” thick in the baking pan . Measure 2/3 cup heavy whipping cream in a glass liquid measuring cup. Heat cream in microwave for 50 seconds or until very warm, but not boiling,. Add 1 cup chocolate morsels, to the cream, stir until smooth and shiny. The ganache will be thin. Mix heavy cream on high speed until soft peaks form. Fold whipped cream together with the ganache, stir until smooth. 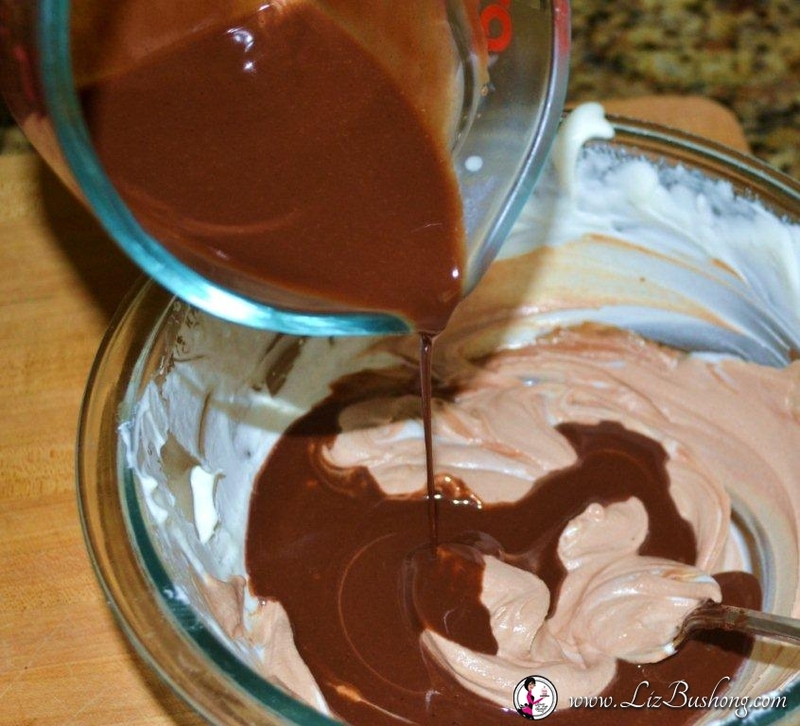 Place the mousse in a glass measuring cup so you can pour the mixture into the molded cups. ( you do not have to spray the mold). Freeze the mousse 20 minutes. Chocolate Mousse being poured into silicone baking mold. 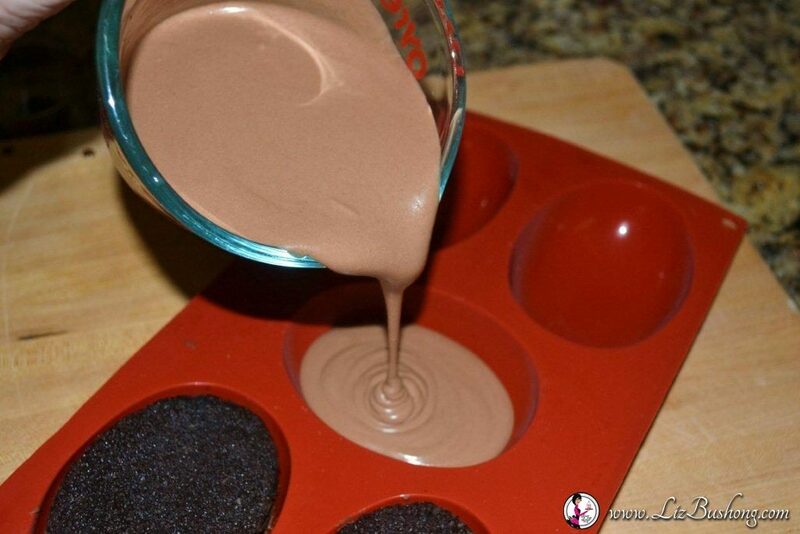 Cut out chilled brownies using a 2 ” round cookie cutter the shape of the mold cups. ( I used a large 3 inch oval metal cookie cutter for the egg shape.) It worked perfectly and fit the diameter of the oval mold. Add the cut out shaped brownie on top of frozen mousse. Freeze brownie and mousse in mold for 3 hours. ( This will make the cake easier to remove and glaze). Line parchment paper on a baking sheet then place a wire baking rack on top of the sheet. This will help catch left over ganache. Un-mold the cakes onto the baking rack, leaving 3″ apart. Use a small ladle to pour the thinned ganache over each cake making sure the cake is completely covered. You can scoop this chocolate back up and reuse or eat it as you go. 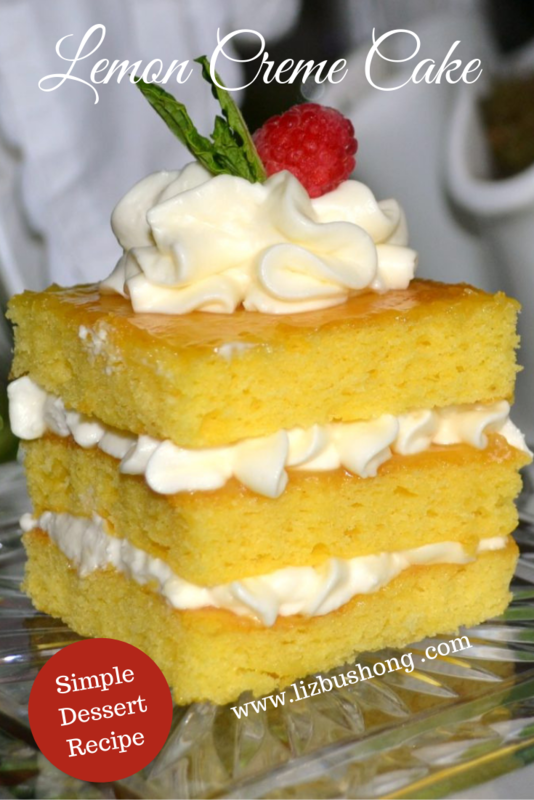 Decorate cakes with butter cream frosting. You will need three disposable piping bags with tips, 104- flowers, 352 leaves, and tip 5 for making dots & zig zags. 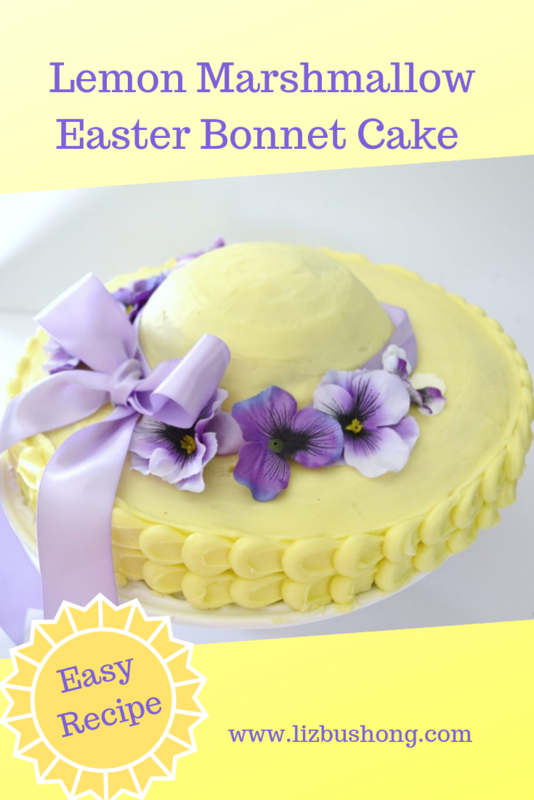 Tangerine, hot pink and lime green buttercream frosting decorate the oval shaped cakes to resemble an Easter Egg. 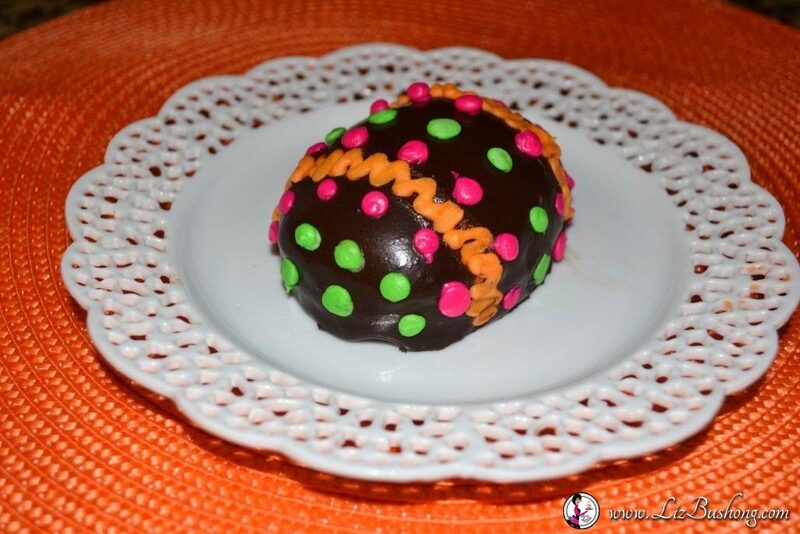 Make-a-head individual mini cakes. A baked cut out brownie is placed over the frozen chocolate mousse then a thin layer of chocolate ganache is poured over the entire cake. Decorate with buttercream frosting as desired. 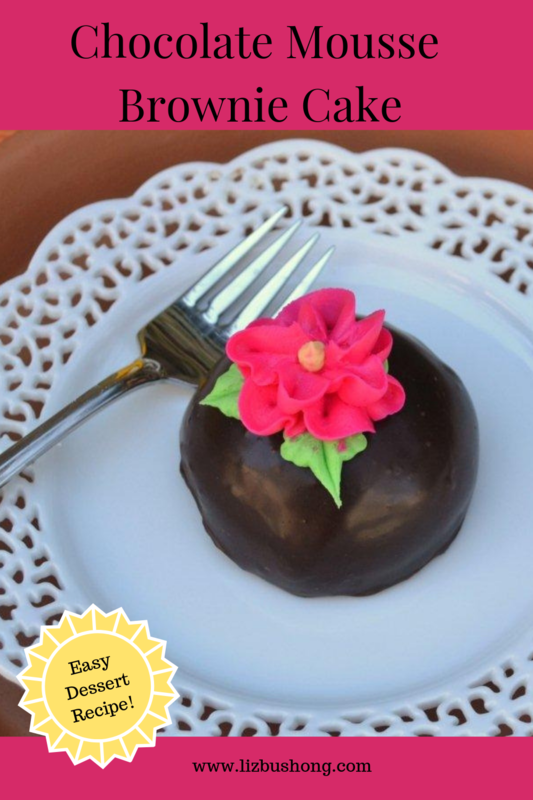 You will need a half round silicone baking mold to make the domed cakes. Also allow 3 hours for freezing time before covering with chocolate ganache and decorating. To make egg shape use oval silicone baking mold. Microwave 2/3 cup heavy whipping cream for 90 seconds in glass measuring cup. Add 1 cup mini chocolate chips to cream. Stir until smooth and set aside. In mixing bowl, beat 1/2 cup whipping cream to soft peaks. Add confectioners sugar, beat until still peaks form. Take two tablespoons of whipped cream and add to the chocolate mixture stir gently to temper the chocolate. Add remaining whipped cream to melted chocolate, stir until smooth. Pour or pipe mousse in half round silicone baking mold. Refrigerate to chill while making brownies. Brownies- Add all ingredients in mixing bowl and hand stir batter until smooth. Lightly grease and line with parchment paper 9″ x 13″ baking sheet. Pour batter into baking sheet, smooth top or giggle pan to level batter. Bake at 350 for 15-20 minutes or until center of brownies are done. Bake longer is center is not fully baked. When cool, freeze brownies 10 minutes to firm. Cut brownies the same size as the silicon half round baking mold or egg mold. The cookie cutter should fit the diameter of the mold. Place cut brownies on top of the chocolate mousse. Freeze 3 hours to solidify. Heat 2/3 cup heavy whipping cream in microwave safe bowl. In medium mixing bowl, place 1 cup mini chocolate chips and pour heated whipped cream over the morsels. Stir to smooth. Do not allow ganache to sit, it will thicken. The ganache should be mixed throughly but thin for easy pouring over mini cakes. On a baking sheet, place a cooling rack. Un-mold mousse and brownie cakes on the cooling rack. Pour ganache over the cakes to completely cover on all sides. Decorate the mini cakes with buttercream frosting as desired. Decorating with buttercream frosting. Divide frosting into three separate custard cups. Tint each cup with food color gel, one color per bowl. Stir to desired color. Fill pastry bag fitted with flower tip # 104 pink or red frosting. Fill pastry bag fitted with Leaf tip #352 with green frosting and third piping bag with tip # 5 yellow frosting. Pipe leaves first, then flower and last yellow center dots. Keep desserts chilled until ready to serve. Can be made ahead but decorate an hour prior to serving. Use a 2-1/2″ round cookie cutter for the half round mold. For egg shape cookie cutter the size is 3″. Use a large round cookie cutter to make the oval shape for the egg by reshaping the metal to fit the egg mold if you don’t have an oval cookie cutter. Best Cookie cutters are Ann Clarke-made in USA- Vermont. Enjoy! It is delicious and so fun to make.